People signing the Guanyem manifesto. The murmurs quickly became a steady roar, and within just over a month, Guanyem collected 30.000 signatures to support the project. 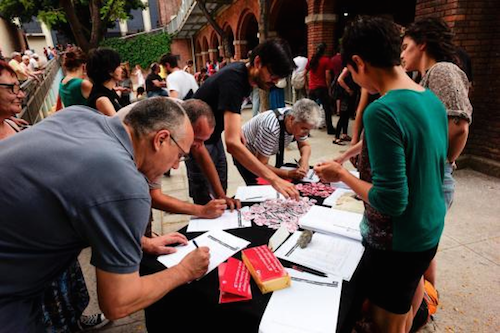 Hundreds of people joined the platform and got involved in its working groups, envisioning a long and complex process. As the model proliferated across the peninsula similar “Ganemos” structures soon emerged in Malaga, Madrid and other cities. Once the signatures confirmed that there was enough backing for a grassroots-shaped candidacy, representatives of the platform in Barcelona got to work and proceeded to register the new political party. Precarity as contraceptive: conversation ..
Manuela Zechner is a researcher, cultural worker and facilitator. Moving between the UK, Austria and Spain. She has finished a PhD thesis on the role of care in precarity movements and neoliberal governance. Her main ongoing platforms are the Future Archive project, the Sounds of Movement radio show, and the Radical Collective Care Practices blog.